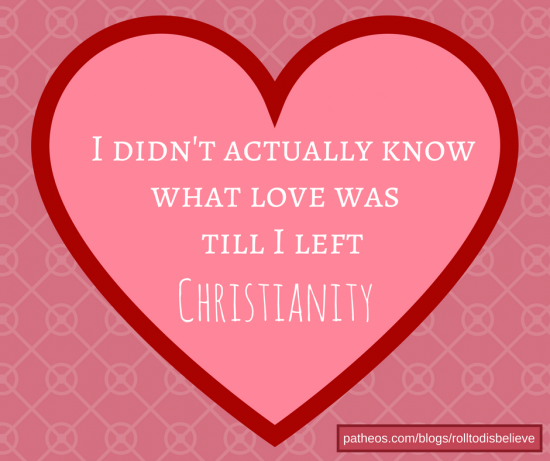 An image of a heart with the text "I didn't actually know what love was till I left Christianity." Image source. 1. Actually, Creationists Do Believe in Evolution (posted November 29) "Yes, really. Let’s think about the timeline here. According to Answers in Genesis, Noah’s flood occurred in 2348 BC. The Tower of Babel occurred in 2242 BC." 2. The Love/Life Principles Seminar: (Not) Making Friends and Influencing People. (posted November 30) "We never learned what acceptance really was, nor that it’s quite rude and controlling to treat others like DIY fix-it projects." 3. ‘All right, then …’ (posted November 29) "Tear up the letter. Turn the raft around. And if you can think up anything worse, do that too."